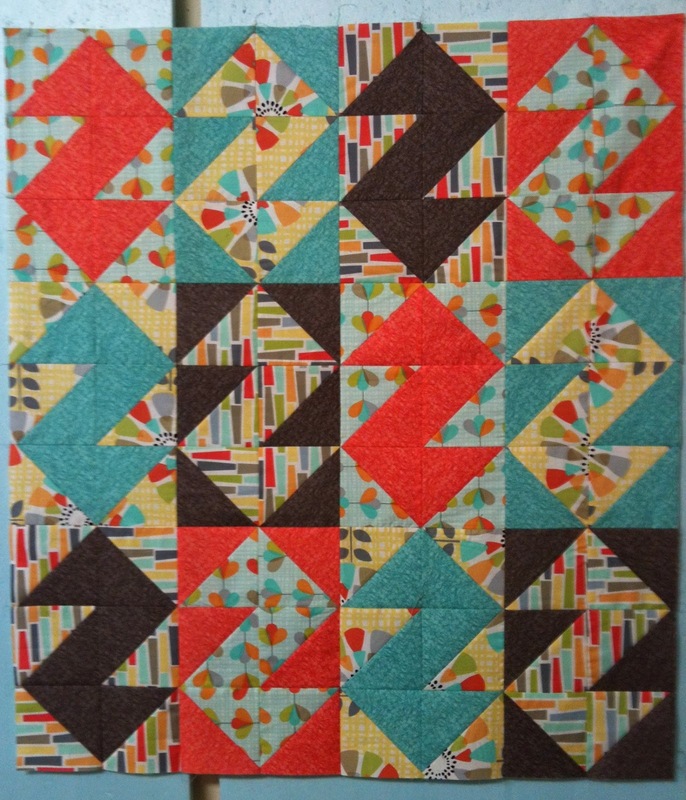 Our Not Your Mama's Modern Quilt Guild decided to participate in the Michael Miller Challenge. We were each given 6 fat quarters of Michael Miller fabric. We had to create something quilted and we could add any Michael Miller fabric and/or any solid fabric. There will be 3 winners and each of them will receive a goody box every month for a year. Woohoo! I have had my fabric and have been stressing over deciding what to do with it for about 6 weeks or more. I am on a quilting retreat this weekend. One of the ladies brought along some quilting pattern books and some magazines. I was shall we say lacking of inspiration so I decided to have a look through her books and magazines. I came across a quilt pattern in Quilty magazine that was called Peppermintz. It was cute and it was made entirely of my Beloved Half Square Triangles. At long last, I had settled on a pattern and I was off to the races. I picked a size that would fit my fat quarters and I got to sewing. A few hours later, I had this adorable baby quilt top. Now all I have to do is quilt and bind it. I think I like mine better than the original. I would vote for me. Would you?